List management is a macro level to deal with contacts and take actions on them at your convenience. This provides a detail view of contacts with respect to mailing lists. How do I edit mailing lists? How do I delete mailing list? How do I export subscribers? Once you create your Zoho Campaigns account, you'll be redirected to our welcome page, where you can start creating your first mailing list or email campaign. From the Navigation toolbar, choose Subscribers and select Manage Lists. Click Create in the top-right corner of the screen. Name – This is the name of your mailing list, for internal reference. Categorize the mailing list by associating it with a topic/purpose depending on your email marketing type. Help subscribers join this list - Enable it if you want subscribers to join your mailing list via signup form. Keep it disabled if you want to make your list private. Tell subscribers how you know them – To maintain transparency, it is mandatory to let the subscribers know why they’re receiving this newsletter. This information will be added in the footer section of every email campaign. If you have chosen GDPR compliant email marketing, you'll have to associate all the new mailing list that you create, with a purpose(purpose of email marketing). If you have chosen either Permission-based email marketing or Consent-based email marketing, you'll have to associate your new mailing lists with a topic. It is recommended to associate your new mailing lists with a topic/purpose, so that all your mailing lists are categorized. You can send newsletters to only categorized mailing lists. Add Subscribers – Manually add subscribers. Import subscribers – Import contacts from your computer, Zoho CRM, or Google Sheets. Add Signup Form – Create your own signup form to add subscribers directly from various sources. 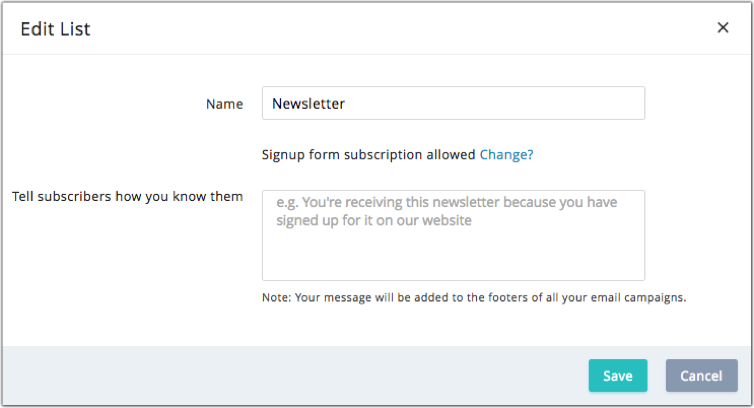 You can edit the mailing lists to enable or disable a signup form, adjust the details in the lists. Mouse over the mailing list, you wish to edit. Click the More icon and then click Edit list. A pop-up will appear where you can edit the list. Click the Save button to confirm. In email marketing business, you may feel a list is absolutely useless and might want to get rid of it. Well, though you can delete a list, you don't have to necessarily delete the contacts in the list. You can delete just the list and still maintain the contacts associated to the list. Mouse over the mailing list, you wish to delete. Click the More icon and then click Delete List. A pop-up will appear where you can delete the list. 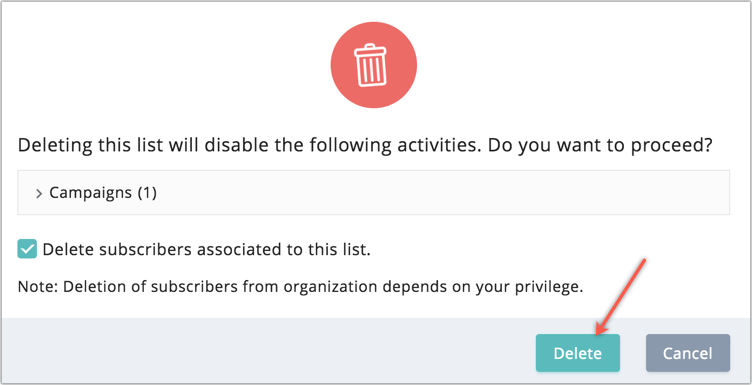 You can select the checkbox to delete the subscribers that are associated with this mailing list. 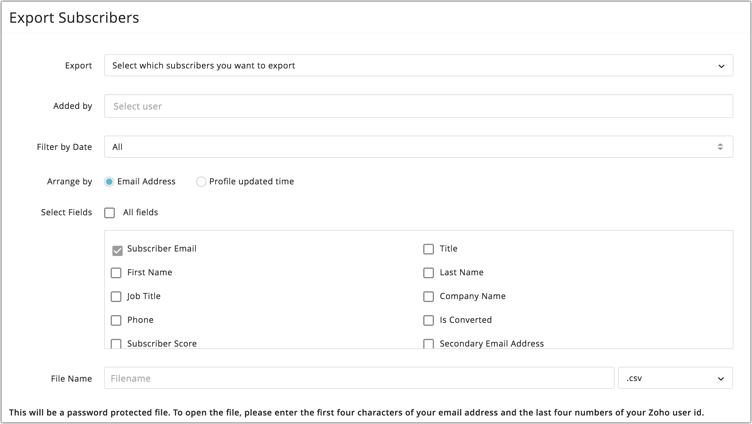 You can export the subscribers of a mailing list to create a backup data. You can choose the fields, file format that you want to export. Mouse over the Mailing List, you wish to export. Click the More icon and then click Export Subscribers. Filter by Date – Select date and time and choose if you want to export all subscribers or based on added/updated time. Select Fields – Choose the fields you wish to export. File Name – Give a suitable name and choose the file format you wish to use. Zoho Campaigns does not include any kind of harmful information or data into your exported files. However, as a precautionary measure to safeguard yourself from unknown security threats, it is recommended that you look for warnings about executable operations when you open an exported file in MS Excel. Please refrain from updating any commands in the CSV file exported from Zoho Campaigns. 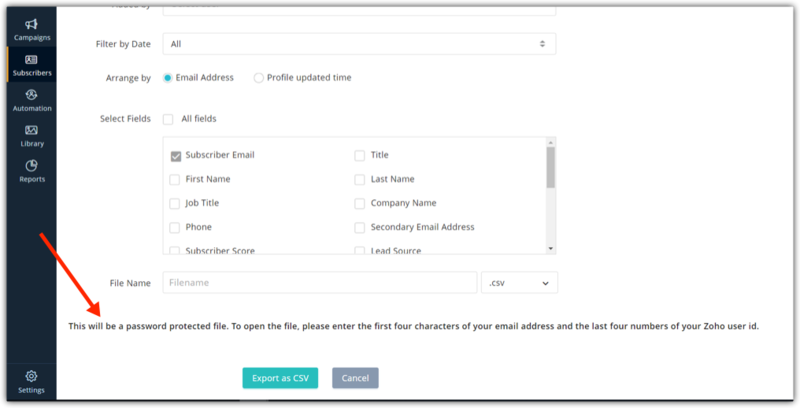 You can update a specific field for bulk subscribers in simple and quick way. Mouse over the Mailing List, you wish to mass update the subscribers. Click the More icon and then click Mass Update. Select the field from drop-down menu, you wish to update. Specify a value for the field to be updated. Click the Proceed button and then Update to confirm changes. 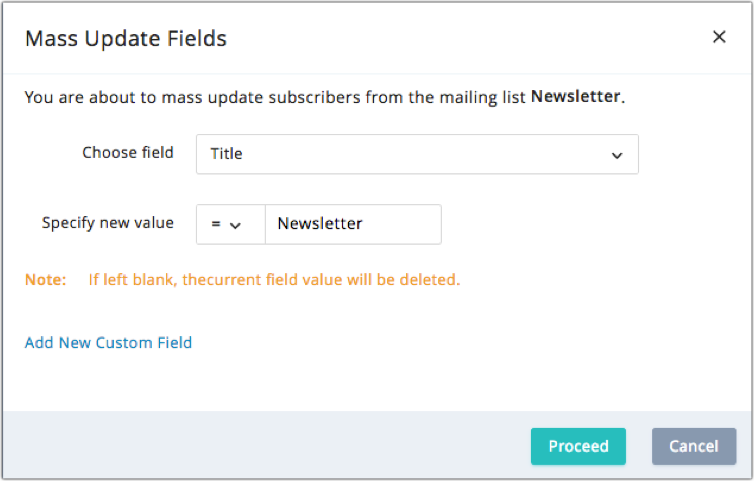 You can select a specific segment of a mailing list or select few subscribers under All Subscribers to mass update fields. You can also select subscribers through global and advanced search and mass update the fields. 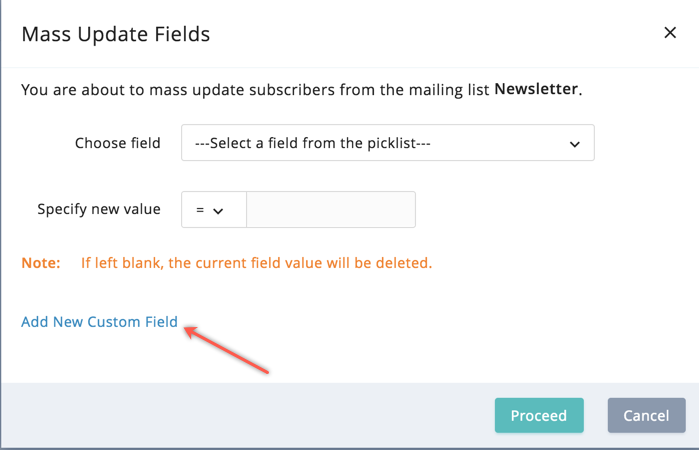 Yes, you can mass update a new custom field for bulk subscribers. A pop-up will appear. 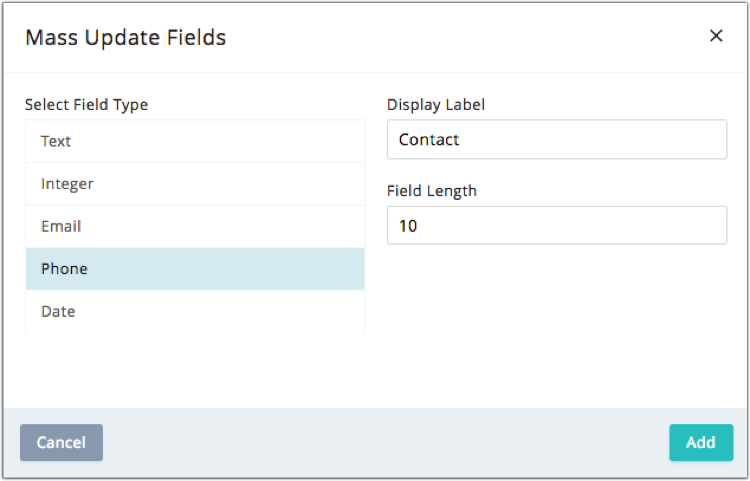 Click Add new custom field link to create a new custom field. Click the Add button and then Update to confirm changes. You can delete the subscribers of a mailing list while keep the mailing list intact. Click the mailing list, you wish to clear. Click the More icon and then click Clear List. A pop-up will appear. Click Go Ahead to confirm. If you feel the same set of subscribers from two different lists are interested in the same product/newsletters, you can combine both mailing lists to create a new one. This could also be for maintaining a master list for your subscribers, getting rid of duplicate or to maintain a backup for your subscriber details. Click More andselect Merge Lists in the top-right corner of the screen. In Merge Mailing Lists page, click the From List to select the mailing lists you want to merge. Now, click the To option to select the mailing list to drop-down menu to merge your contacts to an existing mailing list. Click Merge to New List to merge the subscribers to an entirely new list. Click the Merge button to confirm. You can enable "Delete From Lists after merging" checkbox to delete the mailing lists chosen in From List drop down. You can export your subscribers in any format so that it provides a backup for your database. Apart from this, if you’ve sent a campaign to a mailing list, you can easily track the active subscribers. While exporting the list, we’ll give the option to filter only active subscribers. Thus, you can maintain a clean list by importing the active subscribers to a new list. Click More andselect Export subscribers in the top-right corner of the screen. Export – Choose the type of contacts to be exported. Added by – select the users whose subscribers you’d like to export. Arrange by – Opt on how you want to arrange the subscribers. Select fields to be exported – Select the checkbox fields to include additional information. File Name – Give a name to the file to be exported. Click the format (CSV, TSV, XLS, JSON, etc. ); you want to export the file. Based on GDPR guidelines and to maintain data security, the exported document will be password protected. You can open the document by entering the first four characters of your email address and the last four numbers of your Zoho user id. The Import Overview page contains all of your imported subscribers' details. You can view a generated report on your subscribers after the import is complete. Zoho Campaigns makes it easy to view the entire history of imported subscribers in a single step. From the Navigation toolbar, choose Subscribers and select Manage Lists. Lists. Click More andselect Import Overview in the top-right corner of the screen. In the Import Overview page, you can view the number of newly added subscribers, duplicate subscribers, and ignored subscribers. Just click one of the numbers to view the related subscriber details. Why are some of my subscribers ignored? Bounced - Mail was undeliverable to the subscriber or the email address doesn't exist. Blocked- Subscribers blocked by Zoho Campaigns. Do-Not-Mail - Subscriber has been moved to do-not-mail registry. Group Email(s) - Subscriber address is generic. E.g., info@, administrator@, careers@, service@, support@, etc. File Duplicate(s) - Subscriber is present more than once in the file. Invalid Pattern - Subscriber has an with invalid address. E.g., "johngmail.com", "jane@aol", "ted@zylkercom"
Empty Email - Subscriber's email address field is empty. Other Errors - Subscribers categorized as miscellaneous and don’t fall into the above-mentioned categories. What is the difference between delete, unsubscribe, and do not mail? What does it do? Subscribers will be removed from the mailing list. You can add them again if necessary. * When a subscriber unsubscribes, they would either be removed from that mailing list or the organization depending upon their choice. You can unsubscribe a subscriber from a mailing list if you want. You can move the subscriber to do-not-mail registry if you do not want to send emails further to that user or if they unsubscribe from the organization, they'll be moved to do-not-mail registry. Who and when can you perform this operation? You can delete any subscriber provided you have the necessary privilege. Subscribers who have signed up or imported via other products can unsubscribe either from a mailing list or the organization. You can unsubscribe a subscriber if you do not want to send them camapigns. You can move any subscriber to do-not-mail registry provided you have the necessary privilege. A subscriber can unsubscribe from the organization if they want to. How can this operation be reversed? You should add the subscriber in the list manually. Subscriber can either sign up again or click the resubscribe button in the unsubscribe confirmation email. Subscribers can be added back to list by the user who moved the subscriber to do-not-mail registry. If they've unsubscribed from the mailing list, they should subscribe again. *Re-adding deleted subscribers is not advisable. Please try to avoid this. Why aren't group email addresses accepted while importing? Zoho campaigns restrict the import of group email addresses such as info@zylker.com, support@zylker.com, admin@zylker.com, and help@zylker.com. These email addresses have a high probability of email getting landed in the spam folder. 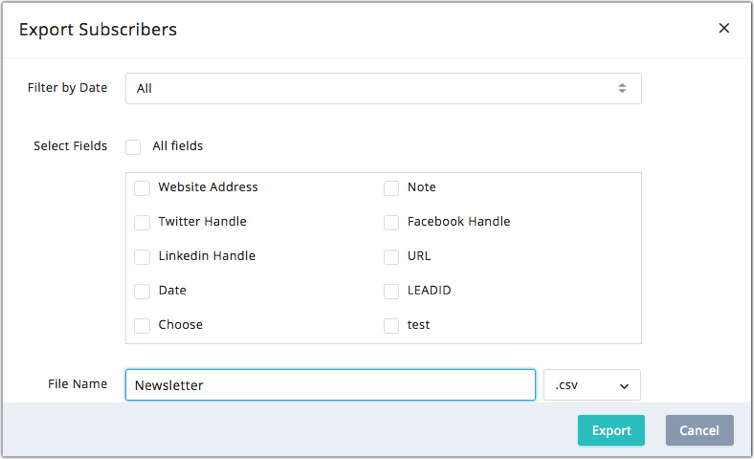 You can make your sent email campaigns public by embedding the campaign archive code on your website or social media account. This will make your subscribers or public members to have an instant access of sent campaigns, newsletters and updates. You can consolidate the past campaigns and make it viewable on your website so that anyone can view as well as share on social media. Click on the Mailing List, you wish to archive the campaigns that were sent. Click More andselect Campaign Archive in the top-right corner of the screen. If you've specified your email campaigns to be listed in the campaigns' archives, you'll get redirected to the Archive Code page. In the Archive Code page, click Archive Settings button. Customize your Archive Display by selecting the options below. Click the Show drop-down menu to select the maximum number of campaigns to be displayed. Click the Sort drop-down menu to select your chronological preference. To show or hide the Campaign Sent Date, choose the related radio button. To show the campaign in the same or separate window, select the related radio button. Select campaigns, you wish to show, in the section. Click the Generate Archive Code button. In Archive Code page, copy the generated code displayed in the box. Paste this code into your website to embed the sent campaigns. You can click Preview My Archive button to view how your campaign archive would look on your website. You can change the maximum number of campaigns displayed by changing the number in the embedded code. 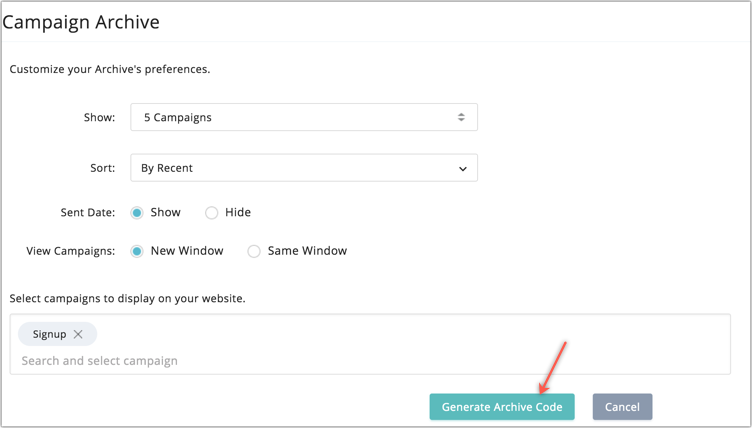 You can edit your archive code and select the options to show the campaign sent date, select your preferences such as chronological order, open in separate tab. You can make a campaign visible or hidden on your website by choosing the campaign under Displaysection. Alternatively, in the final stage of sending an email campaign, click the Campaign Archive button. In the drop-down box select the check box to make your campaign visible. In the archive section of your website, you can view a social bar which will reflect the various social media sites where the subscriber or a public member can like, comment, tweet and share the campaign archive on leading social media. The report based on social stats would be updated in the social stats section of Campaign Reports. From the Navigation toolbar, choose Reports and select Sent Campaigns. 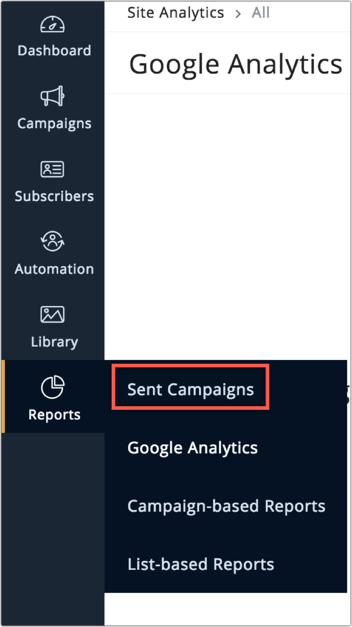 In Sent Campaigns page, click on the sent campaign. Go to the Social Stats situated on the right side menu. Here you'll view the social media reports under Campaign Archive. Mouse over the Mailing List, you wish to add subscribers. Mouse over the Mailing List, you wish to create campaign. Click Create Campaign icon and select Regular Campaign/Advanced Campaign. Mouse over the Mailing List, you wish to create segment. List Summary provides a detail view on subscribers and summarizes the various details in two different views -- Subscriber View and Response View. Click on the Mailing List, you wish to see the list summary. This is a summary of subscribers based on sent campaigns’ s report. It lists out the number of active, bounced and unsubscribed subscribers as well as number of campaigns sent and number of campaigns scheduled for this mailing list. It lists out the number of active, unsubscribed, and bounced subscribers based on last month activity/since last sent campaign. You can setup a notification email that provides the daily report on the number of new subscribers joining the selected mailing list. The report will be sent on daily basis and will provide detailed information about the newly added subscribers coming via Sign-up form or through APIs. Click on the Mailing List, you wish to receive a notification email. In List Summary, click List Signup Summary. Choose the frequency of notification email. You have 8 Time Slots to schedule the Sign-up summary email. Devices and Operating Systems – It provides information about the gadgets (Computer, Tablet and Mobile) and operating system (Android, Linux, Windows, and Apple) used by the user. Email Clients – It lists out the different email clients such as Outlook, Lotus Notes, Thunderbird, Apple Mail, etc. used by subscribers. Web Browsers - It lists out the different web browsers such as Firefox, Chrome, Internet Explorer, Safari, Opera, etc. used by subscribers. This graph highlights the number of subscribers that have been added to your lists over time. You can view the list growth for a specific time period by choosing the particular time frame from the drop-down in the top-right corner of the graph. Mouse over the dots to view the number of subscribers added on a specific day.